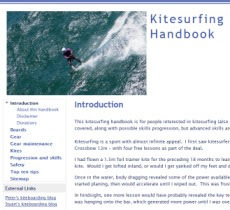 Peter's kitesurfing blog: Inverloch surf beach to inlet downwinder - woo hoo! Inverloch surf beach to inlet downwinder - woo hoo! We nailed it. Some good wind blowing around midday so we rigged up at the surf beach and started kiting. It was great fun in the surf with some good waves about. After we all got settled we headed for the inlet across the mouth. Tarren stopped for a while with his kite above his head. We found out later that he unscrewed a loose fin from his board and put it in his pocket before continuing. We headed for the point at the other side then back. We walked across a sandbar to get some flatter water. I clocked a good maximum - 46.9 km/h - on one of my fast runs. It was more congested in the inlet but still good going. I was happy to make it to the sailing club rather tired but very satisfied. The consensus among myself, Stuart and Tarren was that the surf was the best fun.